Where elegant meet a romantic experience, Manca Villa promote slow life and will pamper everyone for a perfect bliss with all the services. From the floating breakfast, candle light dinner, romantic full flower decoration in the pool, and good location where we can see a legendary sunset of Bali. The villa is so thoughtfully designed, from the entrance, the door, the wooden wall that depicts local arts, ceiling and the exterior that combined modern and Balinese culture. Nestled in border of Canggu, Manca Villa surrounded by top-notched restaurant, coffee shops, beach clubs and renowned beach such as Berawa and Batu Belig Beach for enjoyable romantic getaway in Bali. This villa featuring three units of one bedroom villa with private pool and each complemented with bathtub which is separated by living and kitchen area that completed with villa facilities and guest amenities. All of the interior and exterior are stylish, with Balinese arts and lush vegetation to increase a homey ambiance. This is essentially a tour of La Vie Villa Legian, which is very close to Seminyak in Bali. Bali is well-known for honeymoon and we decided to opt for that and we chose this romantic 1 bedroom private villa in Bali and we were not disappointed. The price was the best value we could find and it was luxurious and private enough for us. About the review for that place itself, we plan to make another video but here’s a few pointers, it’s a relatively new villa with a nice. modern and unique concept. The price is really reasonable and you’ll get a nice cosy room with a clean private pool just next to it. Comfy bed and clean spacious room were some of the many things we liked. The staffs were really professional, kind and helpful, ever smiling when you come across the lobby and anywhere else. That’s what I call and excellent service and warm hospitality. 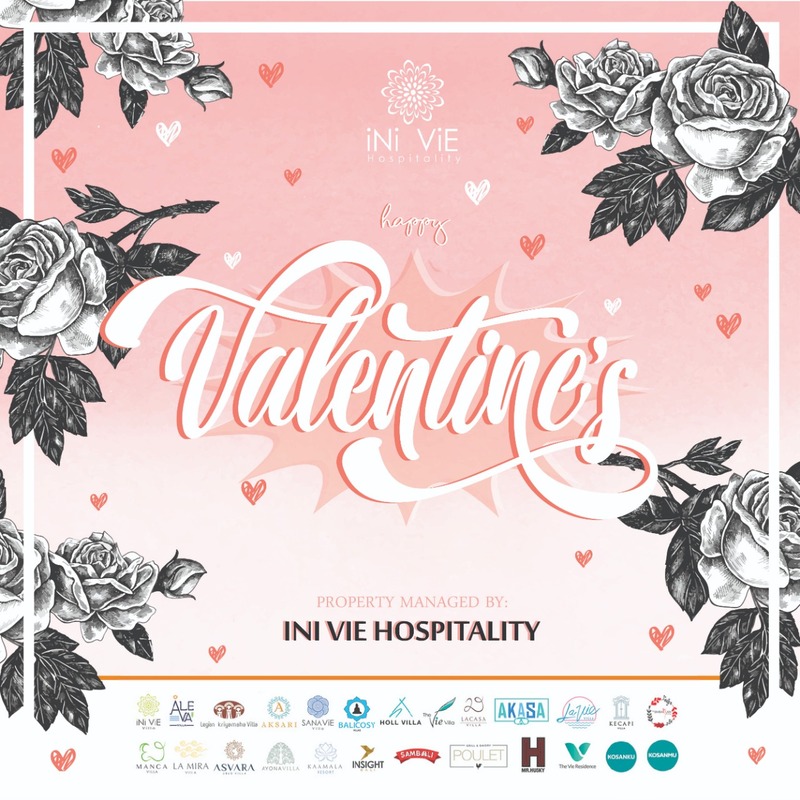 We are pleased to announce that this week we have the best employee within Ini Vie Hospitality management. Since we opened in 2012, we always pay attention on the human resource as it was a spearhead of the company. We aware that the rewards will soaring the enthusiasm for better performance near the future. This because we passionate in details of what we do. Hi guys, my name is Desy Ayumi Mayasari Sayuna and my nickname is Desy. I’m 28 years old and Bachelor of Managerial Accounting of Bali State Polytechnic. What do you feel about being the best employee on the first quarter of 2019? Of course I’m really happy and never dreamed about it before. What you’ve done so far? I always do all of my works on my top performance and deeply understanding my product as well as service knowledge of Ini Vie Hospitality Management. Do you have an outlook for your team or company? Near the future, I hope that Ini Vie Hospitality has developed its services for the stakeholder and appreciate more for the employee that resulting on high enthusiasm and motivated the crew to do the best. What’s your best moment since joined? We are pleased to announce that this week we have the best supervisor within Ini Vie Hospitality management. Since we opened in 2012, we always pay attention on the human resource as it was the spearhead of the company. We aware that the rewards will soaring the enthusiasm for better performance near the future. This because we passionate in details of what we do. Hi, my name is Ni Luh Ayu Leony Kusuma Merti. Just called me Leony. I was 22 years old and Dhyana Pura University alumnus. I’ve been interesting on a rare hobby like no other women for making Macrame, an art of making homeware and furniture. What do you feel about being the best supervisor on the first quarter of 2019? I’ve been joined with the big family of Ini Vie Hospitality over one years and a half. As I started to begin my career I posses as front office staff and after that I get promoted as supervisor for Jimbaran Villa. Overall I’m always happy with my job and enjoy every moment that I had. It is hard to believe that I was selected as the best supervisor at first. This owing to my education background compared with my position that need improvement. But I believe with more effort and encouragement from my family, my husband and my team I’ll do my best on everything that I work on. That’s the key of my performance. I also educated and motivated my team in order to more discipline and cleaver based on the standard operation so that the guest of my villa feel satisfied with the services. That’s why now The Jimbaran Villa is the number one accommodation B&B’s/Inn in Jimbaran. Do you want to share something or an outlook? I hope that the company get more successful so that there will be many people joined and give the opportunity for those who had the best competency on the specific fields. There are so many beautiful moment that I had, but the most important thing is, I get my career increasing rapidly compared with any other person with the same age and education background. Thanks Ini Vie. La Mira Villa is a family getaway and the tropical family villa with spacious room surrounded by lush greenery. We can see and feel it as we go through the entrance till in front of the bedroom. Dominated with yellow color, wooden furniture attached with well-crafted sculpture, this stylish villa makes us homey and bring pleasant experience while staying in Bali. Since opened in December 2018, La Mira gaining its popularity as a Family Villa. It featuring one villa of three bedroom with private pool and bathtub, three villas of two bedroom with private pool and stylish bathtub as well. The bedroom also equipped with LCD screen TV containing 60 channel selections, DVD player and complimentary Wi-Fi internet connectivity on all room, Netflix, mini-bar, iPod docks and a huge selections of room service. Each villas completed with kitchen, living area, sunbed and hammock and get us a sense of home. La Mira is completed with four stars standard villa facilities and services by personalized Balinese hospitality and friendly staff . This makes La Mira has their own style as contemporary and luxurious villa. Besides a private pool, La Mira has completed with spacious garden that suitable for small party, barbeque or a place where the kids can play. Apart from family spacious room, La Mira is best fitted for every honeymooners or a romantic getaway with extras touches. One of the unique moment whilst staying in La Mira Villa is the floating breakfast. A satiating breakfast in private pool that floats right in front of us. Presented in a large, sturdy tray, the floating breakfast is a complete morning meal, with a hot beverage, warm breads and condiments. What a picturesque moment. Or, try either full flowers bathtub or sliced fresh fruits that boosting our mood to relax. We can choose other options to surprise our beloved one based on request. Such as romantic surprise of hellium balloons in the room with an ambient color that can be subject for surprising on our special moments such as honeymoon, birthday, baby shower and wedding anniversary. Moreover, this villa also offers a distinctive experience of dinner with a romantic candle light. This charming tone will make our beloved one the happiest with a tasty treat. La Mira Villa is perfectly positioned to enjoy Bali’s spectacular nature and tourism spots. Situated in the hub of Seminyak, this villa only five minutes away from renowned Berawa Beach and close to another beaches where we can see legendary sunset of Bali. La Mira surrounded by coffee shops, world-top leading restaurants and beach clubs like Tropicola, Mrs Sippy, Potato Head, Ku De Ta, The Finns Club in 15 minutes driving. And, it only takes 30 minutes from I Gusti Ngurah Rai International Airport. These simplicity puts La Mira as the best place to enjoy a pleasant experience in Bali. 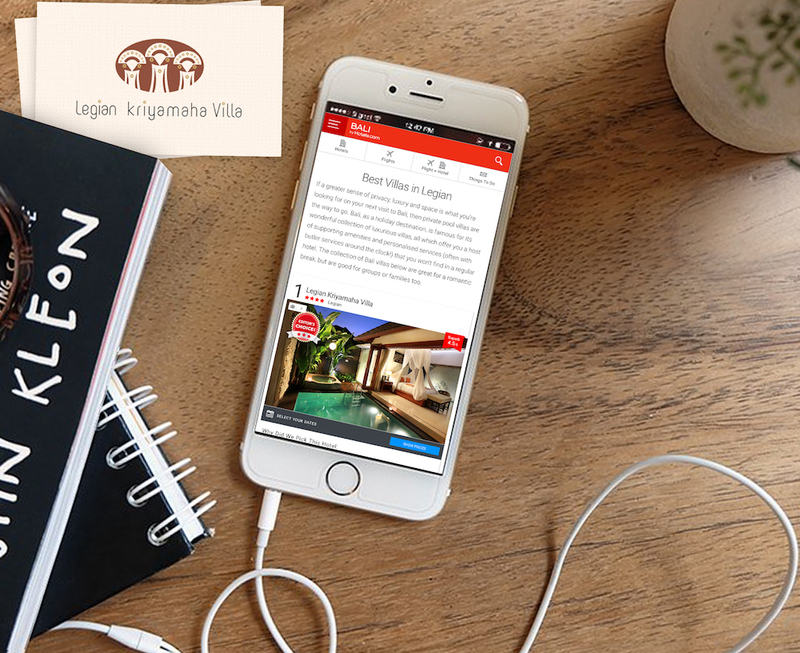 We are glad to inform that recently Legian Kriyamaha Villa has selected as the second best B&Bs/Inns in Legian from TripAdvisor, the world’s largest travel site. We took a lot of effort for being the best on what we do and always passionate on every details. As a villa that serve bed and breakfast services or commonly shortened to B&B, we strive to give the best accomodation and good quality of food. Moreover, often people reviewed us as a place where they can sense a romantic circumstances and get the intimate experience. There are hundreds of people that has been reviewed us on TripAdvisor and feel the excellency of our staff and the services as well. Hence, we are trying so hard to maintain and improve this quality. 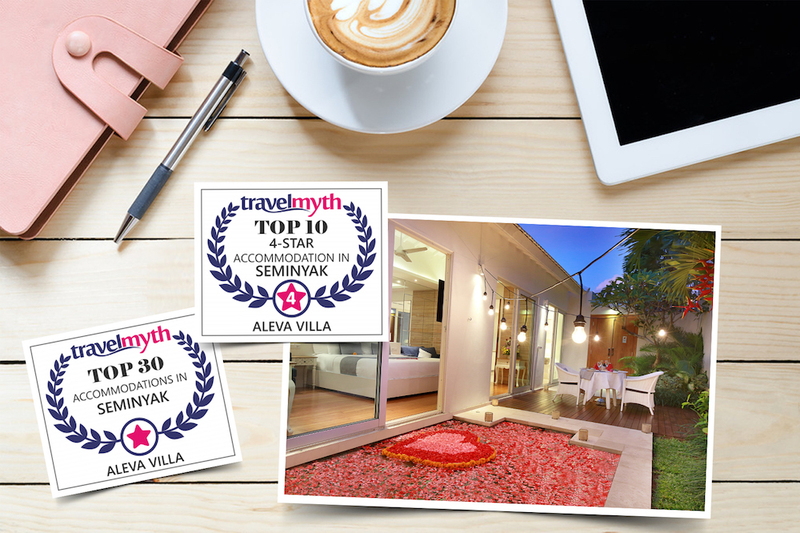 Not only from TripAdvisor, since we opened the villa on July 2013 we also received many awards and reviewed by well-known international media. Thanks for supporting us. Legian Kriyamaha Villa nestled between Legian and Seminyak that are popular area at the southern of Bali. Close to renowned beaches, such as Double Six Beach and it takes seven minutes driving. Surrounded by leading speakeasy and beach clubs like Potato Head Beach Club and many others world’s top restaurant. Overall, this villa offer nine villas of one bedroom villa with private pool and bathtub. The bedroom also equipped with 50 inch LCD screen TV with 60 channel selections, DVD player and complimentary Wi-Fi internet connectivity, Netflix, mini-bar, iPod docks and a huge selections of room services. Apart from the facilities, the enchanting of Legian Kriyamaha lies on the special packages. There are six different packages that are suitable for every purposes. Ranged from Romantic Getaway Package, Romantic Honeymoon Package, Anniversary Package, Birthday Package, Baby Shower Packages and Romantic Valentine Day Packages. Moreover, we can enjoy the floating breakfast. A satiating breakfast in private pool that floats right in front of us. Presented in a large, sturdy tray, the floating breakfast is a complete morning meal, with a hot beverage, warm breads, and condiments. Alternatively, we can also have a beautiful dinner surrounded with candle light that lies on the pool and the table with intimate decoration. All of these services will give you pleasant experience during your stay. As a part of villa services and facilities, there are also full day tour and half day tour throughout Bali with the comprehensive range. From sightseeing the enchanting highland of Bali, family strolls among the paddies and forest till enjoying the sun, sea and sand in the beachfront. 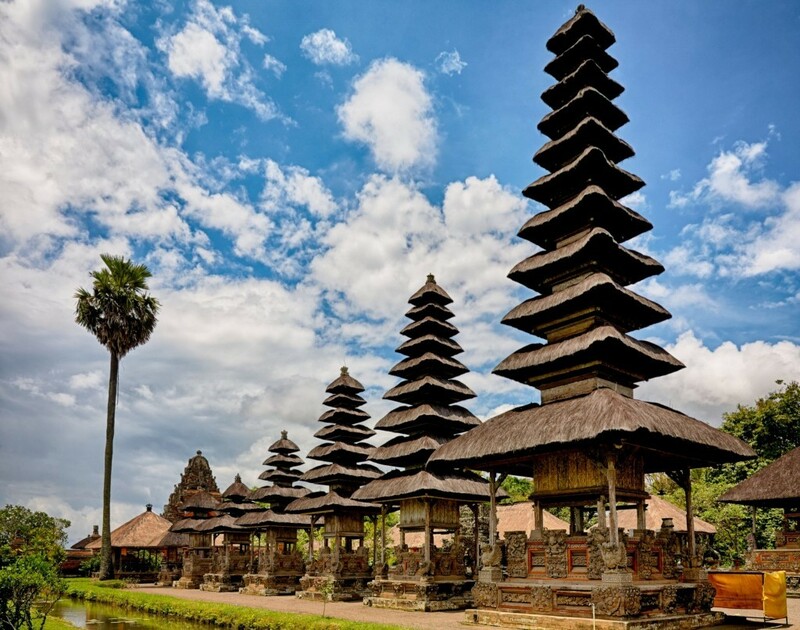 The professional drivers will also bring us to traditional Balinese social life to the most sophisticated place that attracted many international and domestic traveler. This to make your stay with Legian Kriyamaha Villa more intimate and memorable. Today we relase new video on Youtube Channel Ini Vie Hospitality. Ini Vie Hospitality is proudly presents new Kecapi Villa - A new ambiance for Family Getaway Villa in Seminyak Bali. The villa earmarked for family getaway by featuring Two Bedroom Villa with Private Pool and Three Bedroom Villa with Private Pool that could be converted to One Bedroom with Private Pool which is completed with bathroom in each room and bathtub, large private pool, kitchen with kitchenette and living area with standard villa guest amenities and supplies.Personalize service by professional staff who always taking care and make you having quality time with your family during stay. It takes 30 minutes drive from I Gusti Ngurah Rai International Airport with perfectly located in Seminyak area where many cafes and restaurants by walking distance along with only 7 minutes drive to the nearest beach and famous beach club in Seminyak and Canggu that make you and your family more having fun during family getaway in Bali.. Enjoy! Paket romantis di Aksari Villa ini menawarkan kemewahan yang bisa mempererat momen mesra Anda dan pasangan. Dilengkapi dengan private pool dan jacuzzi, villa privat di resort indah ini memahami kebutuhan pasangan yang ingin intim berduaan tanpa takut ada gangguan dari orang lain. Asyiknya lagi, paket ini sudah termasuk candle light dinner di dalam villa yang disetup oleh para staff profesional resort. Anda dan pasangan hanya perlu bersantai dan menikmati semua pelayanan optimal yang ditawarkan oleh pihak resort. Being tropical romantic villa, La Vie Villa aim to encourages its guests to indulge in the serenity and romantic place. This villa combines white and pink color with beautiful decoration on every corner, lush vegetation and stylish furniture to create a unique ambience that appeals to the senses and comfortable for energetic young honeymooners. Apart from that, La Vie Villa also the best and convenience place to celebrate the wedding anniversary, baby shower and during stay for a vacation in Bali as well. Nestled in Legian, La Vie Villa surrounded by many tourism spot, renowned restaurants, beach club and only 30 minutes driving from I Gusti Ngurah Rai International Airport. Overall, La Vie Villa offers 10 one bedroom villas with each has its private pool and a romantic bathtub set by the bed for a memorable moment. To increase a homey atmosphere during a vacation in Bali, the huge bedroom also equipped with LCD TV and 60 channel selections, DVD player, complimentary Wi-Fi internet connectivity, Netflix, mini-bar, iPod docks and a wide range selections of room service. Every unit also has its kitchenette and terrace to increase homey condition. Designed as tropical romantic villa, La Vie Villa also has its additional services. Ranged in several style, such as Romantic Floating Balloon in the pool which is included hellium balloon with vibrant color for surprising the spouse. Another one is Romantic full flower decoration in the pool, where full flower put in the pool that is really instagramble and gives us utterly unique experience. Last but not least is a romantic floating candle light in the pool, to make a memorable dinner experience for sure and good to surprised the beloved one. Furthermore, we can also have a service that gone viral, floating breakfasts, which are popping up all over Instagram. A satiating breakfast in private pool that floats right in front of us. Presented in a large, sturdy tray, the floating breakfast is a complete morning meal, with a hot beverage, warm breads, and condiments. Hence, These services make La Vie Villa is one of the most romantic place to stay in Bali. Aside from that, La Vie Villa also offers another way to help us build more intimate time with our spouse like enjoying 60 minutes the Balinese message and shuttle service. So that, no need to find public transportation. As to make a living experience more intimate, we can get a free shuttle service from villa to several renowned beaches throughout Legian and Seminyak, such as Petitenget Beach and Double Six Beach as well as another tourism spot. The shuttle service starts three times in a day from 10.15 to 15.30. In addition, this services also carry us from the villa to airport and vice versa. From the fact above, La Vie Villa has received many reviews on social media and several awards. 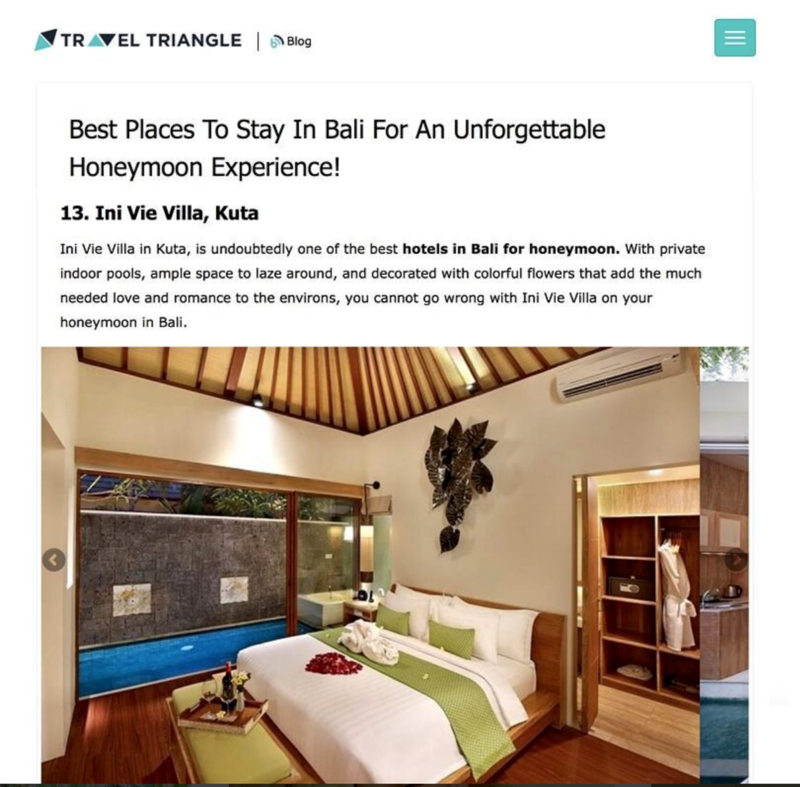 Such as the best place for marriage proposal and one of the best B&Bs villa in Legian from the traveler community on TripAdvisor last year, which is world’s largest travel site. Stylish and loaded with Bali’s arts. Perhaps that is the best way to depicts how the Bali Cosy Villa is. As we entering through the door, we might feel awestruck. This because the door is well-crafted as well as the interiors and the amenities within. There is so many Balinese sculpture from the entrance through the private pool and the Jacuzzi on each room. Unlike many others villas, we can truly feel the atmosphere of Bali with its paintings and decoration that have different colour theme which dominating by white and blue followed by opal partition. Well-done and tastefully. This villa will make us comfy whilst we stays in Bali for honeymoon, a vacation, birthday, wedding anniversary or even baby shower. Situated at the heart of Legian, neighborhood area of Kuta and Seminyak which is well known for tourism area, Bali Cosy Villa offers eight units of luxurious and romantic place. It has three distinctive decoration. Romantic Floating Balloon in the pool which is included hellium balloon with vibrant color for surprising your beloved one. Another one is Romantic full flower decoration in the pool, where full flower put in the pool that is really instagramble and gives us utterly unique experience. Last but not least is a romantic floating candle light in the pool, to make a memorable dinner experience for sure and good to surprised the beloved one. To increase a homey atmosphere during a vacation in Bali, Bali Cosy Villa has its huge bedroom which equipped with LCD TV and 60 channel selections, DVD player and complimentary Wi-Fi internet connectivity, Netflix, mini-bar, iPod docks and a huge selections of room service. Every single room also has its kitchenette and terrace. 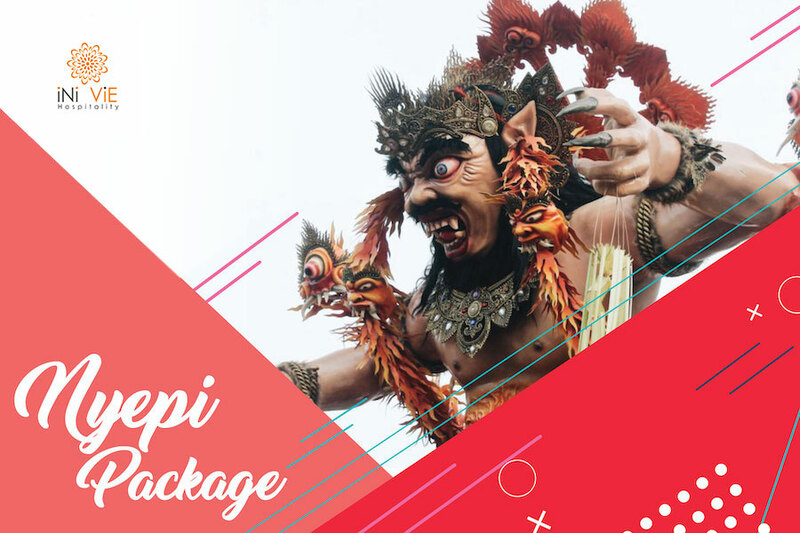 We can also get a free shuttle service from villa to several renowned beaches throughout Legian and Seminyak, such as Petitenget Beach and Double Six Beach as well as another tourism spot and speakeasy and restaurant. This villa really strategic. The shuttle service starts three times in a day from 10.15 to 15.30. Hence, often visitors feel more private and intimate with their spouse while staying in Bali. Due to its excellent services, last year Bali Cosy Villa has nominated as one of the best villa out of 94 villa in Specialty Lodging performance throughout Legian from the global traveler community on TripAdvisor, which is World’s Largest Travel Site. Another awards given by Hotels Combined, the Australian-based hotel meta-search company, that has started an extensive survey covering different types of accommodations within the Indonesia on March last year. From this survey, Bali Cosy Villa shows an outstanding accommodations services, nor recurring or unresolved issues. Moreover, it has also well-trained staff that demonstrating their commitment in providing quick assistance professionally. Property name boasts a high satisfaction rating among guests and travel industry experts, receiving 190 reviews for an impressive rating of 9.3 out of 10. During our most recent trip to Bali, Cam and I had the blessing of staying at one of the most beautiful villas in Seminyak: Sana Vie Villa. I had been looking at this place online for so long before the trip and was so happy that we had the opportunity to stay there as it is totally gorgeous, take a look for yourself! It is located very close to the central area of Seminyak, with countless restaurants, beach bars, boutiques and markets around to keep you busy. We hired a motorbike from the villa for our period of time there and it was just so easy to get around on, even though it was so tempting to spend our time lazing around the pool. When we arrived at the villa we were presented with a tasty fresh coconut drink while we checked in and settled into our stunning room. I really love that places in Bali add these little extra touches to make your experience more enjoyable! One of the things that had caught my eye about this villa were the cool floating breakfast trays! Waking up in the morning and having brekkie in the pool to cool off from the warmth of the balinese morning was so heavenly. We had to pay a little extra to have the floating tray each morning but it was SO worth it. Here are great villas in Legian you can afford. All offer luxurious amenities for a stay in one of southern Bali’s most exciting beach resort areas. Private villas that come in one to two-bedroom options (and even more) offer you great privacy and intimacy, while some of these selections are paired with private pools clad by tropical gardens. 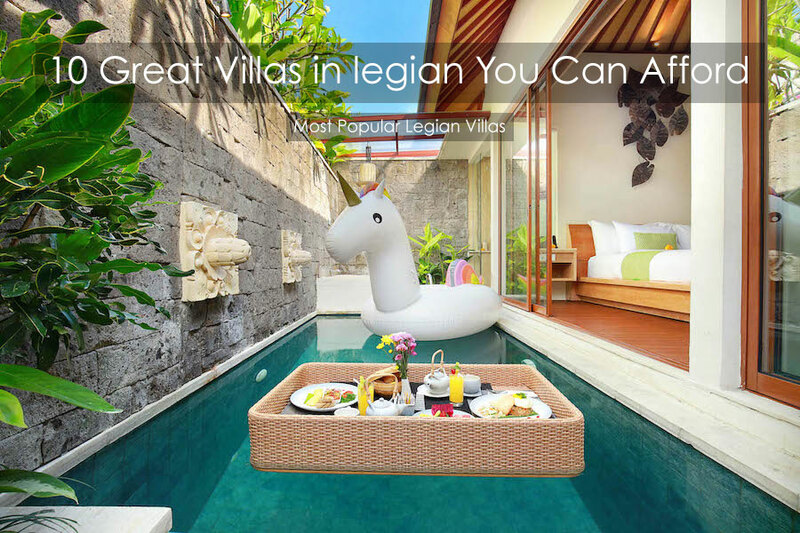 If you’re looking for a more memorable stay that normal hotels usually don’t provide, then these selections of the most popular Legian villas should be on your list of considerations for your next Bali holiday. We've narrowed down the many choices and selected these 10 great villas in Legian. You can book your dream villa vacation in Bali here, with just a few clicks! Legian Kriyamaha Villa is a three star boutique resort that is situated between the border of Legian and Seminyak.While the immediate surroundings offer plenty of peace and quiet, guests are within close proximity of Kuta where they can enjoy the hustle and bustle of the city.Ngurah Rai International Airport is only 15 minute from the resort, making it easy for guests to start their vacation the moment they land.Double Six Beach is only about seven minutes from the resort as well.The Legian Kriyamaha Villa is a nine unit estate that combines the traditional Balinese designs with a distinctly modern, Western influence. With a stay at Ini Vie Villa in Legian (Dewi Sri), you'll be within a 10-minute walk of Krisna and Kuta Galeria Shopping Arcade.Featured amenities include dry cleaning/laundry services, a 24-hour front desk, and luggage storage.Free self parking is available onsite. Bali Cosy Villas is a small, 4 star establishment of 8 private villas located in the high class beach neighborhood of Seminyak. Each villa has one bedrooms with attached bathrooms, a private pool, Italian style showers, wardrobes, safe deposit boxes, Tv and DVD in each bedroom, satellite channels, Wi-Fi, and fully equipped kitchens.Villas are dived into 2 categories, those with open air living rooms with ceiling fans and those with, air-conditioned closed living rooms.Interiors are decorated with an eclectic, minimalist blend of traditional Balinese and modern design.Balicosy Villas has private pools surrounded by gardens and a sun terrace with lounge chairs for relaxation. With a stay at The Vie Villa in Seminyak (Nakula), you'll be convenient to Legian Beach and Kuta Beach.Featured amenities include a business center, limo/town car service, and express check-in.For a surcharge, guests may use a shuttle from the airport to the hotel (available on request) and a cruise ship terminal shuttle. If you’re coming to Canggu as a couple, or even better, on honeymoon, you’d better book yourself into Manca Villa. The team that run this place really know how to make newlyweds feel like regular royalty, with decorative touches and lashings of flower petals that make you feel like you’ve been turned into superstars rather than just married. For couples who haven’t taken the plunge (or who already have), it’s quite easy to see why this is the best villa for couples in Canggu: rather than rattling around a huge space, it’s the intimate surroundings of Manca Villa that give it a lovely, cosy feeling, like it truly is just you and your partner alone in a little bubble of secluded luxury. Plus the price is great, meaning even young couples can enjoy this villa in Bali without worrying about overspending. A little touch of paradise. One of the review on Tripadvisor last year to depict how enchanting Legian Kriyamaha Villa is. They celebrate the secluded wedding anniversary in a romantic gateway with extras touches like flower in the pool, bath and candle light dinner that are so memorable for them. Another review of Legian Kriyamaha Villa as the second home during in Bali that makes everyone shortly fall in love and come back later. Planning for intimate experience with the spouse and feel like royalty for a moment. Legian Kriyamaha is nestled in between Legian and Seminyak which is popular area at the southern of Bali. Close to renowned beaches, a wide range variety of restaurant and boutiques. As we enter the villa, we can see a stunning pool full of flower that brings us on the top of exuberance. Besides the pool, the jacuzzi tub that fit for two persons also filled with flowers that boosting our mood to relax and pamper with spouse. We can choose other options to surprise our beloved one based on request. Such as romantic surprise of hellium balloons in the room with an ambient color that can be subject for surprising on our special moments such as honeymoon, birthday, baby shower and wedding anniversary. Legian Kriyamaha offer nine villas of one bedroom villa with private pool and bathtub. The bedroom also equipped with 50 inch LCD screen TV with 60 channel selections, DVD player and complimentary Wi-Fi internet connectivity, Netflix, mini-bar, iPod docks and a huge selections of room service. Each villa has been well designed with romantic ambiance and truly intimate, completed with four stars standard villa facilities and services by personalized Balinese hospitality and friendly staff who take care and comfort you as your home in Bali. Through architecture and its luxurious interior design, the place invites each guest to immerse in every detail that makes it a unique residential ambience. In addition, this villa also offers a distinctive experience of dinner with a romantic candle light. It is obvious that its charming tone will make our beloved one the happiest with a tasty treat. Another unique moment whilst staying in Legian Kriyamaha Villa is the floating breakfast. A satiating breakfast in private pool that floats right in front of us. Presented in a large, sturdy tray, the floating breakfast is a complete morning meal, with a hot beverage, warm breads, and condiments. A picturesque moment. Surprisingly, this villa has special offer this month. Only this March. Check the information below for further information. To make our vacation more easier, this villa come with Artificial Intellegence ( AI ) called Alexa . The list of Alexa commands is expansive and grows with every new service or device it supports. Alexa great at understanding natural language. We can ask for the weather forecast, for recommendation place for everything we have to know in Bali as well as to play a music or radio. If you are looking for Bali honeymoon villas to escape into the world of romance with your better half, this is the ultimate guide for couples to visit best tourist spots in Bali. Whether it’s the glorious in-house setting or the charming outdoor view that set the tone of romance, our collection of 30 romantic Bali villas has something for everyone. Book your honeymoon packages in Bali which will make your honeymoon more romantic. This romantic and intimate escape in South Bali is one of the sweetest honeymoon villas in Bali. This little 1-bedroom hideaway is comfortably spacious and has its own private pool and a Jacuzzi tub fit for 2. You can take your in-pool romance to the new heights with a generous sprinkling of flower petals. With a morning dip in the pool, enjoy your royal floating breakfast. Yes, that’s right. Ini Vie offers a floating basket which let you enjoy the first meal of the day in the pool. For a romantic and intimate experience, Legian Kriyamaha Villa is one of the most favored honeymoon villas in Bali. Each Kriyamaha villa has a 1-bedroom suite which comes with a private pool and a Jacuzzi tub fit for 2. Besides its gorgeous setting, couples can also opt for romantic services that include flower petal bath in your private pool, candlelit dinner by the pool and floating breakfast. The villas also provide traditional Balinese costumes for a winning honeymoon shoot for a lasting memory. You can also plan such romantic surprises for your spouse by requesting the villa staff in advance. Whenever I go to Bali I love to mix up my accommodation and spend some time in hotels as well as villas. I’ve talked about it before and I’m still cant decide which type of accom I like more. During this trip I spent a couple of nights staying at the Sana Vie Villa, click the link below to read more about the villa & my stay. The Sana Vie Villa is located in Seminyak, its a little bit of a walk out of the main Seminyak square area so I would recommend making use of the Villa’s shuttle service (or hiring a scooter which you can do from reception). The villa feels like its brand new, and they’ve really put a lot of thought into the facilities and design (there’s even a tv in the toilet). Sana Vie is a massive one bedroom villa, that has a huge bedroom area with two couches with a walk through wardrobe to the bathroom & semi outdoor shower. There is a little kitchen area and deck outside, with the swimming pool in the middle. The hammock located over the pool towards the back of the villa was the perfect little resting spot. VisitThe villa offers a wide range of breakfast options, including the popular “floating breakfasts” which are popping up all over Instagram, I 10/10 recommend you try this option at least once. I had the waffles both mornings because they were so yum! I also stayed in one night and had room service, the chicken pad Thai was delicious!!. Today we relase new video on Youtube Channel Ini Vie Hospitality. Video The Jimbaran Villa shot and experience by @carlieshipman. The Jimbaran Villa offers romantic ocean view villa in Jimbaran, defined as secret honeymoon experience and suitable for honeymooner or couple who would spend their intimate escape in Bali. Featuring 6 units One Bedroom Villa with Private Pool and Bathtub which set a roof top with ocean view in all villas and completed with four star signature villa facilities and services. Enjoy! We can also have another option to surprise our beloved one based on request. To make it more tropical, this villa have another decoration in the pool with new standardization where full flower put in the pool, which they call romantic full flower decoration and it is really instagramble and boosting our mood to relaxing. Get in to the jacuzzi and smel the flowers that will give us a remarkable sensation. This villa also offers a distinctive experience of dinner with a romantic floating candle light in the pool, in order to make the pool more romantic one. See the stars and feel the breeze as you have a dinner. What a romantic moment. Based on the facts above, many people or customers feel glad and make some review on a wide range of platform. That is why Aksari Villa has won Traveler’s Choice award as Top 25 B&Bs and Inns in Indonesia this year. An awards given by TripAdvisor based on reviews and opinions that truly exceptional from million of travelers. This luxury private villa offers 14 units of one bedroom and a perfect romantic stay in Bali. Discover Balinese culture, best restaurants and trendy nightlife and shopping while enjoying your holiday at Aksari Villa. 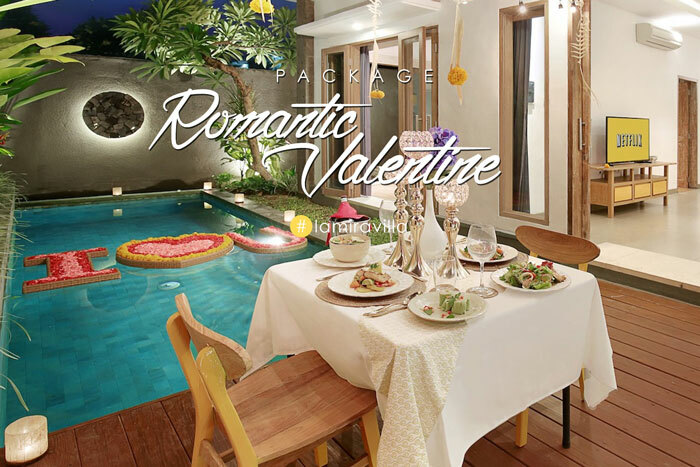 Keywords : romantic one bedroom, private pool villa in Seminyak- Bali, honeymoon, wedding anniversary. Bali is known to be home to some of the most stylish, Insta-worthy experiences. Try a memorable floating breakfast at Aksari Villa, swim in a glass-bottom pool that juts over a cliff, or bathe in a tub filled with fresh petals. Here we’ll show viewers the top 11 experiences to add to their Bali bucket list. Enjoy Video! Today we relase new video on Youtube Channel Ini Vie Hospitality. A short video about our lovely guest @sasha_izum with her beloved one enjoy romantic valentine holiday at La Vie Villa - Bali. Sasha Izum is known as a great model based in China and traveled around the world. Enjoy! Video by @sasha_izum at La Vie Villa Bali. As Travelers choice award, we always keep maintain as #1 of 140 B&Bs / Inns in Seminyak, Bali along with a 2018 Certificate of Excellent on TripAdvisor. Thank you for all our valuable guest who give us an excellent reviews and make us won this award. Video by @art_novozhilov and @katya_nadezhdina at Manca Villa Bali. The month of February may come as a perfect time for some of you to take the current relationship into a more committed one. Well, if you are that person, then now you are reading the right article. We are going to share with you beautiful places to be for a romantic and memorable time, a moment when everything goes well, and the Universe seems to support you, boosting the confidence to pose THE four words question. Unlike staying at a hotel room, a private villa usually has a smaller number of rooms and more personalized service for its guests. It gives you flexibility in case you prefer for a more intimate and private proposal moment. A surprise for your partner, you can explore together during the day, while the villa team sets up the villa room with flowers, dinner set up by the pool, even the team will do a quick exercise for live music for one or two songs if you wish! As your partner opens the villa’s door, looks surprised, bow down and propose! Stunning video from our lovely guest (Putu Aditya) who enjoy family holiday at La Mira Villa. Brand new family villa near Seminyak Bali by Ini Vie Hospitality. We found the Family friendly villa in Seminyak! Check out lamiravilla.com! We are glad to share that our Properties has received a Guest Review Award 2018 from Booking.com which is a travel fare aggregator website and travel metasearch engine for lodging reservations. Base on that, Booking.com has process data opinion from our valuable guest who has booking and review for our property. 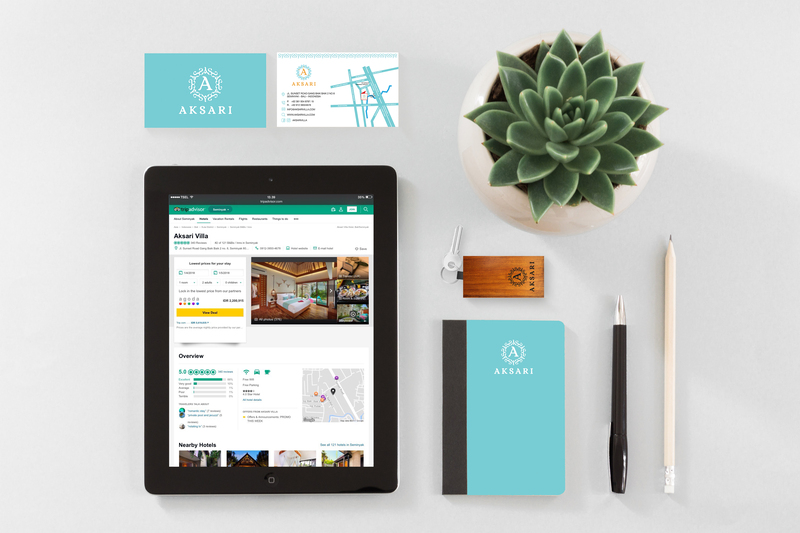 Aksari Villa, resulting in a score of 9.1 out of a possible 10. Aleva Villa, resulting in a score of 8.9 out of a possible 10. The Vie Villa, resulting in a score of 8.8 out of a possible 10. Bali Cosy Villa, resulting in a score of 8.7 out of a possible 10. La Vie Villa, resulting in a score of 9.1 out of a possible 10. Sana Vie Villa, resulting in a score of 8.6 out of a possible 10. Lacasa Villa, resulting in a score of 8.6 out of a possible 10. Holl Villa, resulting in a score of 9.1 out of a possible 10. Akasa Villa, resulting in a score of 8.2 out of a possible 10. Legian Kriyamaha Villa, resulting in a score of 9 out of a possible 10. Ini Vie Villa, resulting in a score of 9 out of a possible 10. Kecapi Villa, resulting in a score of 9 out of a possible 10. Manca Villa, resulting in a score of 8.6 out of a possible 10. We would like to thank you for all valuable guest who trust Aksari Villa as their accommodation during trip in Bali and we keep looking forward to welcoming you in the nearest future. Today we relase new video on Youtube Channel Ini Vie Hospitality. Ini Vie Hospitality is proudly presents Kecapi Villa - A Perfect Family Getaway Villa in Seminyak Bali. The villa earmarked for family getaway by featuring Two Bedroom Villa with Private Pool and Three Bedroom Villa with Private Pool that could be converted to One Bedroom with Private Pool which is completed with bathroom in each room and bathtub, large private pool, kitchen with kitchenette and living area with standard villa guest amenities and supplies. La Mira Villa's designed as a hidden oasis with beautiful walled garden ready to welcoming you as well as naturally pathway lead you to the room. It’s 12.12, it’s time to book direct for staying at our Property, Findout the shocking rate by scanning the barcode or you may use the special promocode IVH1212. This promotion will be available till 12 December 2018 which is staying 12 December 2018 till 22 December 2019. Please makesure you don’t miss it the offer. We are very glad to share that Now The Jimbaran Villa is #1 of 118 B&Bs / Inns in Jimbaran from the global traveler community on TripAdvisor which is World’s Largest Travel Site. We are glad to share that some of our property is Top 3 from the global traveler community on TripAdvisor which is World’s Largest Travel Site. Thank you for all our lovely guest who has given the excellent review on TripAdvisor. We are continuously maintain our best services and excited to welcoming you back at our properties. If you’re looking for a romantic getaway in Bali, then Legian Kriyamaha Villa is the perfect stop for you! During our time in Legian over our trip, we decided to take a couples break and visit the ever so sweet Kriyamaha Villa. The city of Legian is a subdistrict of Kuta, meaning that we were not in the city central, but close enough to take a short 10 minute taxi ride to all the famous cafe’s and shops. Legian Kriyamaha is a very intimate space, offering only 10 one bedroom villas, all with private pools and an outdoor stone bathtub. Like mentioned before, romance is at the very core of this villa! Upon check in, you can order multiple extras on top of your stay like rose petals in the pool or even a romantic dinner in your villa. The best thing is, if you want to surprise your partner or have a special occasion coming up, you can contact the villa beforehand and they can organise a special something like a personal balloon and rose greeting upon arrival. Today we relase new video on Youtube Channel Ini Vie Hospitality. The video is about Honeymoon Experience at A stylish honeymoon villa in Legian Bali and explore feature and facilitirs of Bali Cosy Villa. so what are you waiting for? Make your Honeymoon more unforgettable and memorable with Perfect Romantic Stay #balicosyvilla. Direct, shoot & edit by @commaditya and thank you for talents and supporting team for this video. Bali Cosy Villa has received a 2018 Certificate of Excellence for consisten achievement of high ratings and recognizing 5 consecutive years of consistently high ratings from the global traveler community on TripAdvisor which is World’s Largest Travel Site. Make your Anniversary honeymoon more unforgettable and memorable with Perfect Romantic Stay #aksarivilla. Now, it’s your turn to create your own interesting short video and show the world how happy you stay @aksarivilla. so what are you waiting for? Create your Romantic and Intimate birthday experience with your love and make it an Unforgettable Moment at #lavievilla Now, it’s your turn to create your own interesting short video and show the world how happy you stay @lavievilla. Fresh looks from Insight Bali, today we launch new update in insight bali site https://www.insightbali.com. 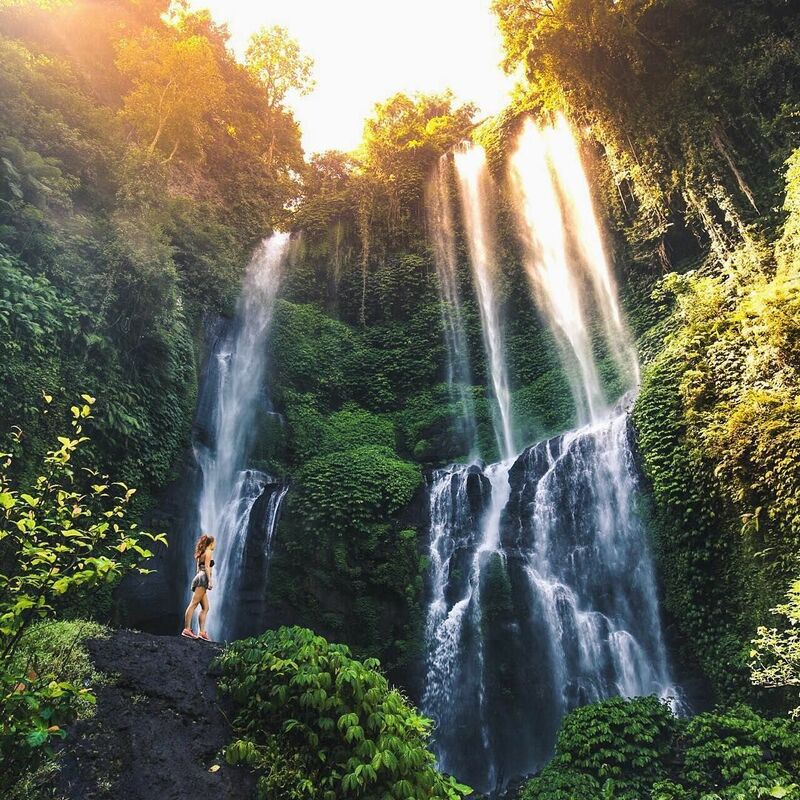 Insight Bali is a travel portal with highly informative, upbeat and inspirational articles dedicated to those looking for travel resources or new experiences in Bali and the neighbouring islands. You will find inspiring travel articles, travel videos, latest news, reviews and even helpful travel guides. We commit to give travellers and the locals an intriguing insight about Bali and its neighbouring islands. Today we relase new video on Youtube Channel Ini Vie Hospitality. Explore honeymoon experience at Romantic Ocean View Villa in Jimbaran, The Jimbaran Villa. featuring perfect shoots by nationwide known videographer @commaditya. Enjoy! Today we relase new video on Youtube Channel Ini Vie Hospitality. Ini Vie Hospitality is proudly presents new villa, The Jimbaran Villa which is designed as romantic Ocean View Villa in Jimbaran villa with intimate ambience and definitely comfortable for energetic young honeymooners who would spend their lovely time in Bali. Enjoy! Ini Vie Hospitality has received a 2018 Award of Excellent from Trust You, the worlds largest guest feedback platform. The Award its for Ini Vie Villa with 594 excellence reviews, Sana Vie Villa with 117 excellence reviews, Aleva Villa with 518 excellence reviews, Legian Kriyamaha Villa with 424 excellence reviews and Aksari Villa with 517 excellence reviews. Thank you for all valuable guest who has given the excellent review on Trust You. We are continuesly maintain our best service and dangerously excited to welcoming you back in the near future..
Ini Vie Hospitality is proudly presents new villa, The Jimbaran Villa will be officially to accommodate the guest who would trip to Bali. The Jimbaran Villa is romantic ocean view villa in Jimbaran, defined as secret honeymoon experience and very suitable for honeymooners who would spend their intimate escape in Bali. Featuring 6 units One Bedroom Villa with Private Pool and Bathtub which set a roof top with ocean view of each villa and completed with four star signature villa facilities. The Jimbaran villa offers romantic services such as flower decoration on the bed, private pool and Bathtub, birthday surprise and anniversary celebration. A well located in Jimbaran Bali, it takes only 30 minutes drives from I Gusti Ngurah Rai International Airport and nearby Jimbaran Beach where you could enjoy one of the famous sea food spot in Bali and many tourist attractions such as Pandawa Beach, the cultural park Garuda Wisnu Kencana (GWK), the maginificent Uluwatu Temple that made your holiday to be memorable one. Today we relase new video on Youtube Channel Ini Vie Hospitality. Ini Vie Hospitality is proudly presents new villa, La Vie Villa which is designed as tropical romantic villa with intimate ambience and definitely comfortable for energetic young honeymooners who would spend their lovely time in Bali. Enjoy! Create your Romantic and Intimate experience with your love and make it an Unforgettable Moment at #legiankriyamahavilla Now, it’s your turn to create your own interesting short video and show the world how happy you stay @legiankriyamahavilla. Ini Vie Hospitality is proudly presents new villa, La Vie Villa which is designed as tropical romantic villa with intimate ambience and definitely comfortable for energetic young honeymooners who would spend their lovely time in Bali. A well-known located in Legian where many tourist attractive nearby, famous restaurants, beach club in Seminyak and only 30 minutes drive from I Gusti Ngurah Rai Airport. Featuring 10 villas of One Bedroom Villa with Private Pool and Bathtub which is completed with four star standard villa facilities. Designed as tropical romantic villa, La Vie Villa is beyond your honeymoon which has A romantic bathtub set by the bed in each villa and offers some memorable package and additional services such as Honeymoon Package, Romantic Getaway Package, romantic candle light dinner and romantic flower decoration in the bathtub that made your stay to be memorable one. Today we relase new video on Youtube Channel Ini Vie Hospitality. Surprise for best friend and showing featured facilities at One Bedroom Villa and Two Bedroom Villa with private pool and bathtub at Sana Vie Villa. The Video Talent is @friscasaputro & @igawinda featuring perfect shoots by nationwide known videographer @commaditya. Enjoy! We glad to share, our restaurant Mr.Husky is listed on "The Hottest & Most POPULAR venues in Bali for 2018!" by The Bali Bible (Official). The writer said "We’ve done the ground work, here are the most popular venues in Bali RIGHT NOW". Today we relase new video on Youtube Channel Ini Vie Hospitality. Video about opening new Two Bedroom Villa at Sana Vie Villa and update romantic decoration at Sana Vie Villa. Enjoy! Nothing sounds better than choosing Bali as a honeymoon retreat. Actually to be honest, when me and Asyraf sat down and tryna figure out all of the places that we wanted to go, Bali wasn’t really high on our list. In fact, it’s not even on the list. Reason because we thought that it was so overcrowded and that it was so common for every couple to spend their honeymoon there. Haha. But due to some circumstances, it eventually became our honeymoon spot and Ini Vie Villa was the first place that we stayed during our honeymoon <3 read more..
It’s lucky day for our property Sana Vie Villa to announce 2018 Guest Rated Award from Expedia.com. Our great thanks to distinguished guests who have supported Sana Vie Villa during the time. We will try our best to improve our services daily to meet your expectation. Thank You. TripAdvisor just released certificate of Excellent on 2018 for their partners and we are glad to share that we are one of their partner who get certificate of excellent on 2018 as we are continuously and consistently earn great reviews from our valuable guest. In 2018, we get 4 certificate of Excellent for our property. The fifth certificate for Bali Cosy Villa since 2015, the forth certificate for Legian Kriyamaha Villa since 2016, and the first certificate for Aleva Villa dan Aksari Villa. It so Amazing! We would like to say big thanks to our valuable guest for great on TripAdvisor. Hello Georges! did you know about Traveler Rangked on Trip Advisor? yes, Traveler ranked is Highest rated hotels on TripAdvisor, based on traveler reviews. We are proud to share Our Property is on the Top Ranked. Aksari Villa is number #2 of Bed and Breakfasts in Seminyak, Ini Vie Villa is number #2 and Legian Kriyamaha Villa is number #3 of Specialty Lodging in Legian Bali. 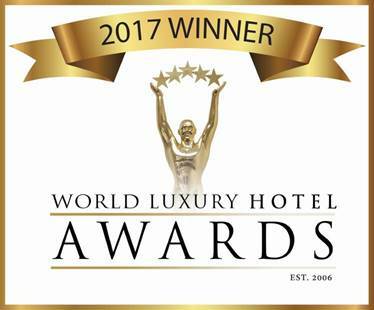 Congratulations to Legian Kriyamaha Villa, Ini Vie Villa and Aleva has won and are a 2017 World Luxury Hotel Awards Winner! In this year’s 2017 Luxury Hotel Award, Ini Vie Villa has won Luxury Romantic Villa in Legian Bali. We are glad and thank you very much for all people who trust and vote us to be a winner. We glad to share our property is nominated on Travelmyth. Aleva Villa, is nominated on TOP 10 4-STAR ACCOMMODATIONS IN SEMINYAK and TOP 30 ACCOMMODATIONS IN SEMINYAK, Legian Kriyamaha Villa is nominated on TOP 3 for 4-STAR ACCOMMODATIONS in Legian and TOP 10 ACCOMMODATIONS in Legian, Ini Vie Villa is nominated on TOP 5 Accommodation in Legian adn Akasa Villa Tulamben is nominated on TOP 10 for 3-STAR Accomodation in Tulamben By #travelmyth. We headed to Legian after returning to Bali for a three-night stay at Ini Vie Villa. This has been one of my favorites so far while staying in Bali. We had an adorable villa decorated with bright flowers with our own private pool that we could literally jump to from our bed. This place was insane. Not to mention they also had an option of a “floating breakfast” where you could have pancakes while chillin in the pool. That’s exactly how every Monday should start. Pancakes poolside. TripAdvisor just released certificate of Excellent on 2017 for their partners and we are glad to share that we are one of their partner who get certificate of excellent on 2017 as we are continuously and consistently earn great reviews from our valuable guest. This certificate of excellent is continuously given to Legian Kriyamaha Villa on 2015, 2016 and now on 2017 for specialty lodging in Legian Bali. We would like to say big thanks to our valuable guest who spare your time to review Legian Kriyamaha Villa on TripAdvisor. 2. Feast on a floating breakfast and snuggle in a poolside swing – Ini Vie Villa If you’re looking for the sweetest little hideaway in South Bali for you and your sweetheart, congrats – Ini Vie Villa is all ready to charm you. 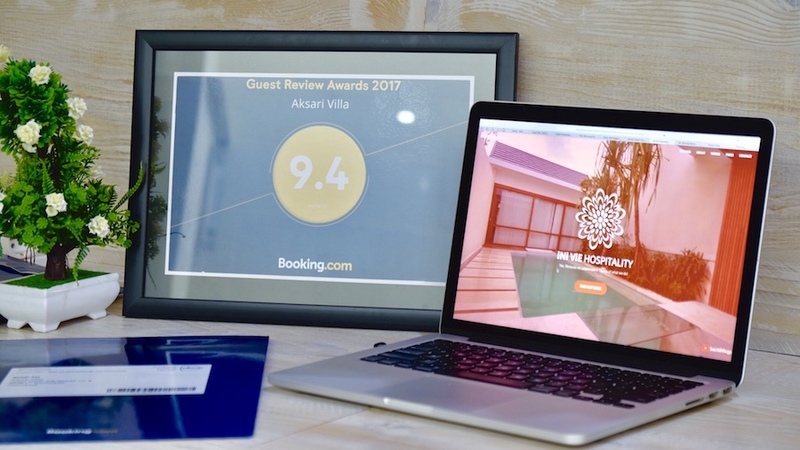 We are glad to share our property is on Booking.com Guest Review Awards with score at 9.3 for Aleva Villa, 8.8 for Ini Vie Villa, 8.6 for Akasa Villa Tulamben, 8.5 for Legian Kriyamaha Villa anda 8.1 for The Vie Villa. Great guest experience happen here.